3D cleaning action (pulsates; oscillates and rotates) for 2x better clean vs. a manual toothbrush. Rechargeable with 6 customized cleaning modes: Daily Clean Sensitive Whitening Deep Clean Massage and Tongue Cleaner. Visible pressure sensor lights up if you are pressing too hard timer indicates dentist-recommended brushing time of 2 minutes. The Oral-B Precision Black 7000 is in a class of its own. High-end features and a sleek design sign up for forces to bring you an unparalleled experience and superior cleaning vs. a regular manual toothbrush. The power of the handle, coupled with the professionally-inspired brush heads, allow the brushes to oscillate, rotate and pulsate to clean 2X better vs. a regular manual toothbrush. The Oral-B Precision Black 7000 is in a class of its own. High-end features and a sleek design sign up for forces to bring you an unparalleled brushing experience and superior cleaning*. The power of the handle, coupled with the professionally-inspired brush head, allow the brush to oscillate, rotate and pulsate, removing up to 100% more plaque and supporting gum health better than a regular manual toothbrush. The toothbrush head surrounds each tooth for individual cleaning and an amazing, tooth-by-tooth clean. The Oral-B Wireless SmartGuide provides real-time guidance to help you brush the way dentists recommend. 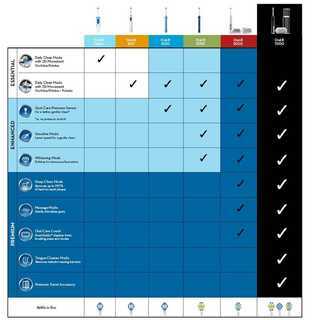 Its quadrant guide helps you brush for the recommended 2 minutes (3 minutes with Deep Clean Mode). The SmartGuide is even wall mountable for your convenience. Oral-B offers numerous toothbrush heads to fit your personal oral health needs. The Oral-B Precision Black 7000 is compatible with a wide range of Oral-B electric toothbrush heads so you’ll get the clean you want, every time. Indicator Bristles fade halfway as a sign to replace your toothbrush head for a better clean (about every 3 months). How does Oral-B’s Oscillating/Rotating technology compare to sonic technology? The Oral-B Precision Black 7000 power toothbrush has more brush movements to remove more plaque than the leading sonic technology. It removes 44% more plaque vs. Sonicare FlexCare to provide a superior cleaning. Plus, the design of Oral-B Floss Action, Sensitive, and ProWhite brush heads mimic the round shape of dentists’ cleaning tools for an amazing, tooth-by-tooth clean. How does Oral-B’s Oscillating/Rotating technology compare to regular manual toothbrushes? The Oral-B Precision Black 7000 was designed to mimic the round shape of dentists’ cleaning tools for an amazing, tooth-by-tooth clean and remove up to 100% (2x) more plaque than a regular manual toothbrush. Additionally, with such a lot of different types and features available, it’s easy to find one that suits your specific oral health needs. According to a 2005 independent study, “Brushes that worked with a rotation oscillation action removed more plaque and reduced gingivitis more effectively than manual brushes.” The review was updated in 2011 with the Cochrane Collaboration reporting results consistent with their early findings*. Oral-B pioneered this oscillating-pulsating and cupping power technology in 1991 and has incorporated it into its premium power toothbrush range ever since. *Yacoob M, et al., British Society for Oral and Dental Research, Sheffield, England; September 2011, Abstract 106. 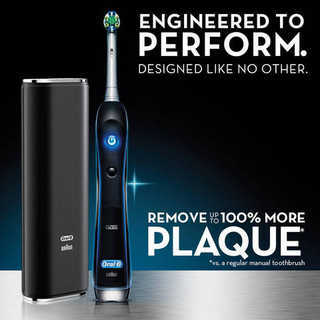 What makes the Oral-B Precision Black 7000 with SmartGuide the most advanced premium power toothbrush from Oral-B? The Oral-B Precision Black 7000 toothbrush combines best-in-class cleaning and gum care with a wireless display to promote better brushing habits. It acts like a dental professional in your bathroom, guiding your brushing experience and providing feedback in real-time to help you brush thoroughly and gently for the dentist-recommended two minutes. It also comes with a premium Trip accessory so you’ll protect this expertly engineered device no matter where you go. What are the customized brushing modes, and how do they differ from one another? The Oral-B Precision Black 7000 features the following modes: Daily Clean, Sensitive, Whitening, Deep Clean, Massage and Tongue Cleaner. Daily Clean operates with 3D movement for a basic, everyday clean. Sensitive operates at a lower speed than Deep Clean to provide a more gentle brushing sensation. Whitening mode is designed to alternate between speeds for a polishing effect on the tooth surface that has been demonstrated to be effective at reducing surface stains. Deep Clean is designed for exceptional mouth cleaning. The Deep Clean features 45-second quadrant cleaning for a total brushing time of 3 minutes, enhancing the results of the standard 30-second quadrant clean for 2 minutes. Massage mode is designed to effectively stimulate and massage gums. Tongue Cleaner lets you better clean your tongue. Which brush heads are compatible? All of the following Oral-B brush heads are compatible with the Oral-B Precision Black 7000 with SmartGuide: Deep Sweep, Floss Action, ProWhite, Precision Clean, Sensitive, Dual Clean, Power Tip, and Ortho. What’s the importance of the gum care pressure sensor? It’s important to brush gently to promote proper cleaning. The gum care pressure sensor permits you to know when you’re brushing too hard, which can cause the bristles to bend and wear out quickly, resulting in less than optimal cleaning. Can you use two handles with one SmartGuide? Yes. Each toothbrush handle can be synchronized with any SmartGuide. One SmartGuide can be calibrated for up to two toothbrush handles. How long does the Oral-B Precision Black 7000 hold a charge? A fully charged Oral-B Precision Black 7000 with SmartGuide lasts for up to 10 days with regular use. To ensure that your battery is in a position to hold its maximum capacity, deplete the battery by the use of without in-between charges until it is fully discharged. Do this at least once every six months for best results. 3D cleaning action (pulsates; oscillates and rotates) for 2x better clean vs. a manual toothbrush. Rechargeable with 6 customized cleaning modes: Daily Clean Sensitive Whitening Deep Clean Massage and Tongue Cleaner. Visible pressure sensor lights up in case you are pressing too hard timer indicates dentist-recommended brushing time of 2 minutes.